**** Chosen by Winner: Evan R.
NOTE: Firearm and optional suppressor will not be shipped directly to winner, but rather to Federal Firearms Licensee ("FFL") specified by winner (or selected by Knife Rights or Hill Country Class 3 LLC d.b.a. Silencer Shop (Silencer Shop), in Knife Rights' and Silencer Shop's sole discretion). Winner can only take possession of firearm and suppressor from the FFL(s). Winner must comply with all applicable legal requirements prior to taking possession of firearm or suppressor. Winner is responsible for for $25 shipping charge and any fees charged by receiving FFL. Click for complete rules. COVERT ARM OF THE FREE WORLD™ This DRD Tactical Paratus® P762 Gen-2 Rifle is an outstanding gas-operated semi-automatic rifle is chambered in 6.5 Creedmoor NATO. The P762 rifle quickly breaks down into large component assemblies, without any tools. It was originally developed for the Clandestine Break Down Sniper Rifle (CSR) project listed by Joint and Special Operations Program. It is the most compact auto loading rifle in the world, with features like folding Magpul adjustable stock. The patented internal recoil system eliminates standard buffer tube/spring which allows the rifle to be fired with the stock folded. It can be stowed in a small briefcase or backpack for travel and it can then be rapidly assembled in less than a minute when the destination is reached. The proven direct gas impingement system cycles the action reliably. The P762 is a patented design. This DRD Tactical P762 includes a Custom Cut Foam Hard Pelican Case. The SureFire SOCOM300 SPS ($1,079) suppressors are test fired and must shoot a group no more than 1 MOA than that of the baseline platform unsuppressed group to pass. Highly specialized V-shaped baffles provide truly unprecedented levels of sound attenuation. Compatible with other calibers 5.56 through .300 WM. Solid high-temperature alloy blast baffle increase durability. Patented no-tools Fast-Attach® design attaches and removes in seconds. Full-Auto rated. Minimal and consistent point-of-impact shift. Lightweight for minimal impact on weapon-handling characteristics. Constructed of advanced high-temperature alloys and stainless steel for long service life. Includes a SureFire SFMB-762-5/8-24 Muzzle Brake / Suppressor Adapter ($149) serves as a rock-solid mounting adapter for SureFire SOCOM Series Fast-Attach® suppressors. * Additional rules apply for suppressors. Click for complete rules. The Crimson Trace LNQ-100G LiNQ ($429) combines a Green Laser Sight and 300 Lumen LED White Light with Instinctive Activation™ for AR-Type Modern Sporting Rifles (AR-15, AR-10, M4, M16, HK416). 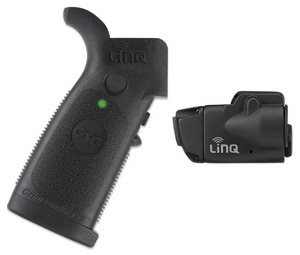 Utilizing a secure, individual wireless connection, LiNQ offers complete wireless control of the laser and light module. The replacement grip is ergonomically designed for quick activation and mode changes, eliminating the need to reach for the rifle's forend to operate. The green laser sight, coupled with a powerful tactical light, offers high visibility in all lighting conditions, making LiNQ the ultimate illumination and targeting solution. 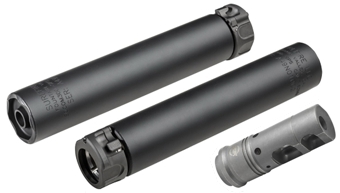 Best performing suppressors for .300BLK (Blackout) system both with Sub and Supersonic ammunition. Quietest suppressor in compared to that of other SOCOM suppressors with minimal increase in back pressure. Capable of being fired on 5.56 through .300WM bolt actions systems. Full-Auto rated on .300BLK Sub- and Supersonic ammunition. DRD Tactical, based out of Dallas, Georgia, offers takedown rifles in 5.56mm NATO, 300 BLK and 7.62mm NATO that utilize the AR-platform design with standard upper and lower receivers. DRD Tactical is a relatively new company, but its truly innovative products have helped it earn a reputation for being “tool makers for clandestine missions.” Established in 2010, DRD Tactical’s first project, the Paratus, was designed to compete in the Joint Special Operation Command (JSOC) Clandestine Break-Down Rifle proposal. Designed to fit in a briefcase, the Paratus features a folding stock, which necessitates a gas and recoil system that does not rely on a buffer tube extension. Since then, DRD Tactical has expanded their line to include more affordable options and additional calibers. SureFire is a story of what can be accomplished with light. The tale begins in 1969 when an engineer with a Ph.D. from Cal Tech decided the future lay in lasers. Dr. John Matthews founded the Newport Corporation to harness the power of the laser for industrial applications. Over the next decade, the Newport Corporation grew to become a leader in the laser field, pioneering a host of industrial uses for the laser. Patents were issued, contracts were won, business boomed. Basking in the glow of success, John’s inventive mind turned toward his hobby and passion, shooting. He wondered if a laser could be adapted to serve as a sight on a firearm. In 1979, John’s concepts became reality as he designed and patented a laser sight. The original laser sight was large and unwieldy by today’s standards. Further refinement of the technology would have required the board of the Newport Corporation to approve substantial investments outside its core business interests. So John, along with several key members of Newport’s technical staff who shared his vision, approached the board with an offer to buy the laser sight business. When their offer was accepted, John resigned as president of Newport Corporation, and assumed leadership of the newly formed company, Laser Products. Now John could devote all of his energy toward the commercialization of laser sights for guns. A handgun sight for a Colt Trooper was the company ‘s first product. A laser sight for a Ruger Mini-14 soon followed. Then, in 1984, the phone rang with a call from a local police agency that would literally alter history for Dr. John Matthews and Laser Products. It was the Los Angeles Police Department’s SWAT Team on the line. The 1984 Olympic Games were to be held in The City Of Angels and the police wondered if it would be possible to borrow a number of laser-sighted shotguns to use for security during the Games. No problem, said John. In the years that followed, the technically superb, but expensive, laser-sighted firearms paved the way for future developments. While none proved commercially viable, the willingness of Laser Products to accommodate law enforcement’s needs led to the development of a novel idea at the time, a weapon-mounted flashlight. The SureFire WeaponLight was born, and low-light law enforcement and military operations would never be the same. Laser Products went on to establish itself as the leading manufacturer of rugged, powerful and compact illumination tools for tactical applications – from weapon-mounted lights and laser sights, shield lights and baton lights to hand-held lights powerful and bright enough to qualify as “force-option” tools that could temporarily blind, unbalance, and disorient a threat. Eventually the SureFire name became so synonymous with excellence in hand-held illumination tools that the company name, Laser Products, was changed to SureFire LLC. We strive, every day to live up to the demanding expectations of our loyal customers. Without our loyal, satisfied customers, the dream that is LUCID OPTICS would not be possible. I can’t begin to express how excited we are to share with you all of the NEW products this year and to see the top sellers continue to gain reach in the industry. Just as important as it was when we began, maybe even more so today, keeping up with today’s political and economic forces is tough enough without spending excessive amounts on the right gear. In a world gone crazy with corporate attitudes and high prices we are proud to still be an exception. This is achieved by challenging stereotypes and thoughtfully creating our items with features and benefits that make sense for the intended use. There will not be any “me too” products in our line. Each one is designed to fit a specific set of needs. We firmly believe that overkill is truly underrated and when applied skillfully and properly there really are no limits to what is possible. We create our products through practical hands on approach, not in a boardroom or in a high-rise building somewhere, but on the range in the hands of capable law enforcement, military, competition and recreational shooters alike. This foundation and approach in the product development ensures that LUCID OPTICS is able to offer a refreshing, functional perspective on all of the critical details of each product we produce. For nearly 25 years, Crimson Trace Corporation® has shipped over 2 million laser sighting and tactical lighting systems to responsible firearm owners throughout the US. Our diverse and passionate customer base includes: the United States Armed Forces, federal / state / local law enforcement agencies, private security officers, concealed carry aficionados, defensive-minded citizens, target shooters and sportsmen. As the undisputed industry leader in weapon-mounted laser sights and tactical lights for pistols, revolvers and rail-equipped rifles, carbines and shotguns, Crimson Trace places a passionate focus on our products because the lives of our customers may depend on it. We engineer each and every Crimson Trace product to be the finest that your hard earned money can buy in terms of quality, durability and reliability. We pride ourselves on providing customer service and support that shines as brightly as the lasers and lights that we package and sell. We are proud of our heritage, our people, our technology, and we are proud of what is coming next. Most of all, we are proud of our customers, our resellers, and our industry partners. It is our pleasure to serve you. As a life-long gun owner, I got involved in buying NFA items (such as suppressors) in 2008. As with many suppressor owners, I found many benefits to shooting suppressed weapons. On my very first suppressor purchase, I realized that although the buying process itself isn’t complicated, a lot of the information that is available is both contradictory and incomplete. Every dealer seems to have different answers for the same questions. Another problem is the instability of many Class 3 dealers who are just doing this as a hobby. Or other dealers who act like you somehow owe them your business – even though they talk down to you and don’t really answer your questions. In 2010, I started Hill Country Class 3 with the goal of simplifying the NFA buying process and providing consistent, reliable support. Shortly thereafter, we went online with SilencerShop.com – as an outlet for information we were gathering, as well as for our online store. From that moment forward, Silencer Shop has been a crazy ride! 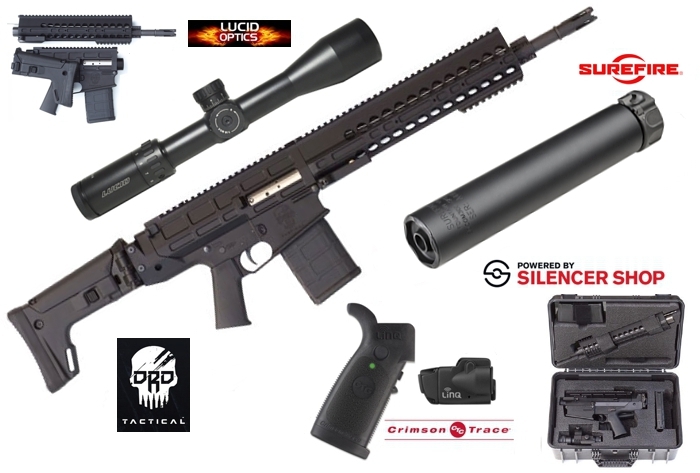 Our goal with SilencerShop.com is to provide you with everything you need to make an informed suppressor purchase, from reviews and videos to the fastest shipping and lowest costs. In short, we want to be your one-stop suppressor shop!